On the occasion of its 10th anniversary, The FLAG Art Foundation is pleased to present Painting/Object: Sarah Crowner, N. Dash, Sam Moyer, Julia Rommel, Erin Shirreff, on view February 23—May 19, 2018, on its 10th floor. The exhibition features new and recent works by five New York-based contemporary artists who draw upon Ellsworth Kelly’s legacy in their varied practices. Painting/Object coincides with FLAG’s exhibition Ellsworth Kelly: Black & White Works, curated by Jack Shear, on its 9th Floor. 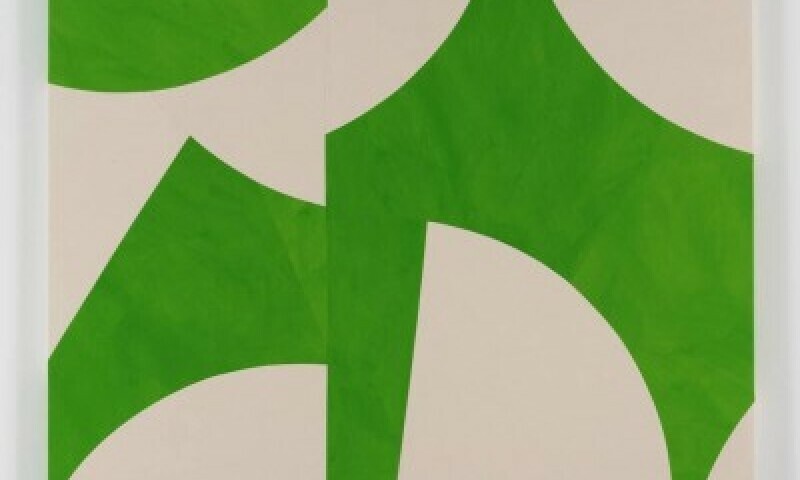 The title of the exhibition refers to a phrase used by Ellsworth Kelly (1923-2015) to describe Window, Museum of Modern Art, 1949, the first work in which he combined multiple relief panels to create one image: “It is the replica of a window that does not exist as either window or painting but as painting/object…the flattening of the forms in paintings condenses vision and presents a three-dimensional world reduced to two dimensions.” Kelly’s newfound direction, which would ultimately become the cornerstone of his oeuvre, disrupted painting’s traditional figure-ground relationship and resulted in an increasingly simplified visual language. Crowner, Dash, Moyer, Rommel, and Shirreff employ similar formal tactics as Kelly, yet each embraces the mark of the artist’s hand to highlight distinctive approaches to construction, materiality, and process.